During conferences at the Moscone Center, The First Person office is surrounded by shuttle buses shipping attendees all around the city. 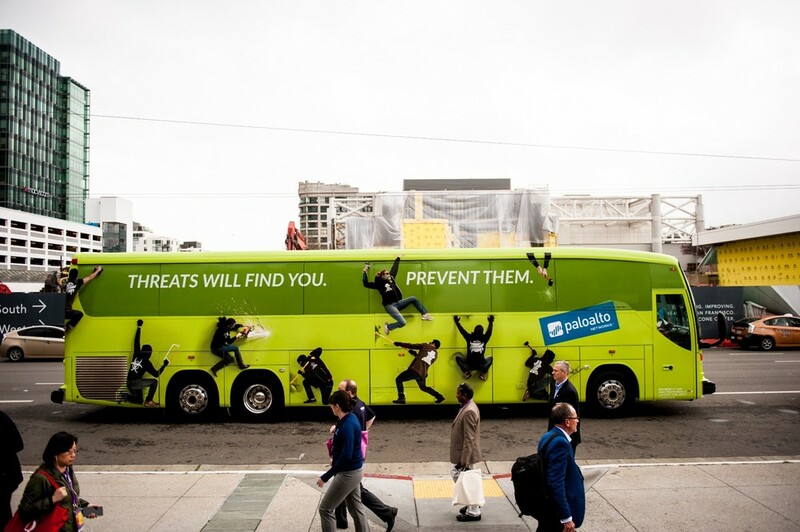 2016’s RSA cryptography and information security-related conference was a special one for us as each member of 1P rushed around the busy sidewalks to see who would get the first photo of the Palo Alto Networks shuttle buses. The reason… Well, that bus was covered with 1P thieves! 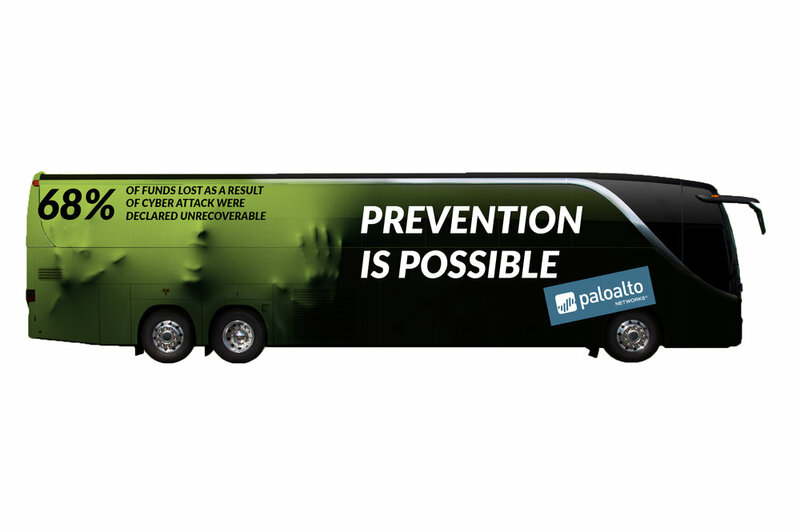 For the conference, we created a bus advertisement concept with Palo Alto that showed personifications of bugs, threats, and malware trying to break into the Palo Alto bus. The depiction of our threats were rendered as life-sized people, and using compositing tricks, we made them really feel like they were trying to break into the Palo Alto secured shuttle bus. At the First Person office, we set up a mini photography studio and our staff jumped at the chance to become thieves and threats. We shot the 1P actors on white and from multiple angles to make the characters look like they were hanging onto the bus. After the shoot, we jumped straight onto our computers and started compositing the characters. We added Palo Alto’s branded symbols for malware, bugs and threats onto each character’s clothing, and worked out the best composition to really draw people’s attention to the scene. With a short turn around, we were able to create all the sides of the bus and deliver them on time to the printers who set about putting the wraps on the bus. 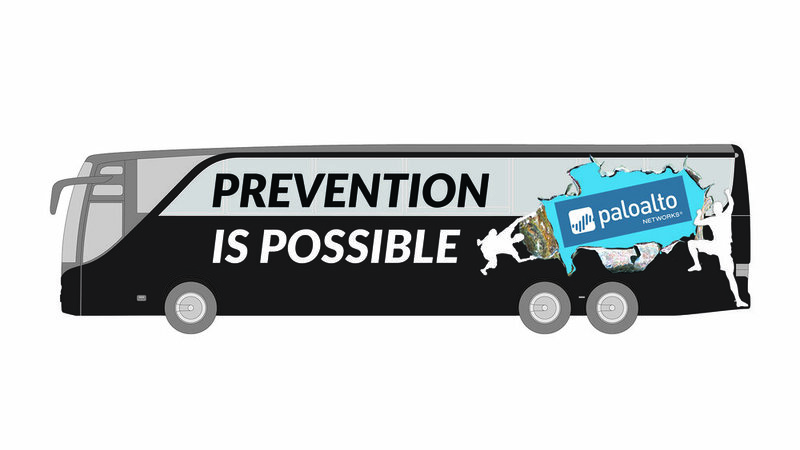 The Palo Alto shuttle buses travelled around San Francisco for 4 days of the RSA conference. It is always great when you see your work in physical form, but as First Person is very close to the Moscone Center, we were constantly bumping into the buses as they circled the city. It became a bit of a game to see who could snap the most photos of the buses. The Palo Alto green made the buses unmissable and bystanders would make a double take as they drove by. This was a great, fun project to work on with and for Palo Alto Networks.